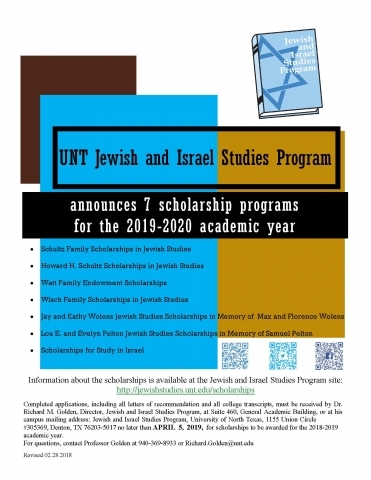 The UNT Jewish and Israel Studies Program offers multiple scholarships from seven funds each academic year. Click here to see the flyer in PDF. Before submitting an application for the Jewish and Israel Studies Scholarships please consult the webpage below for further information for eligibility and requirement information. If you have any questions, please call the Jewish and Israel Studies office at (940) 369-8926. We also offer scholarships for studying abroad in Israel; if you're interested in studying abroad, contact us for a meeting with Dr. Golden, director of Jewish and Israel Studies: richard.golden@unt.edu. Study abroad arrangements can be made through programs such as the one linked: http://www.moia.gov.il/english/highereducation/pages/default.aspx/. Meet the minimum entrance and continuing academic performance standards of the University in effect at the time of the award. Maintain full-time enrollment at the University, unless the student has fewer than twice the number of semester hours required to be full-time remaining in his or her program. Undergraduate students must have a cumulative grade-point average of at least 3.00 on a 4.00 based system, be in good academic standing, and provide transcripts of his or her college record. 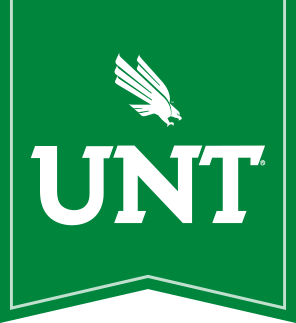 Minors must be enrolled in or have completed two courses at UNT in the Jewish and Israel Studies Program; those earning Certificates must be enrolled in or have completed one course at UNT in the Jewish and Israel Studies Program. Provide letters of recommendation from two of the student's instructors in Jewish and Israel Studies Program courses at UNT, for a minor. For a certificate, you will only need to provide one letter of recommendation. Give a written commitment to minor in or earn a certificate in Jewish and Israel Studies. Submit a 300-word statement describing their anticipated course of study within the Jewish and Israel Studies Program and their objectives within and beyond the academy. Graduate students must have a cumulative grade-point average in graduate school of at least 3.25 on a 4.00 based system. Submit transcripts of their graduate record. Produce evidence that they are researching a M.A. thesis or Ph.D. dissertation in an area of Jewish and Israel Studies. Provide two letters of recommendation from faculty attesting to their academic qualifications and to their commitment to researching a topic in Jewish and Israel Studies for their M.A. thesis or Ph.D. dissertation. Present a 300-word statement describing their anticipated course of study within the Jewish and Israel Studies Program and their objectives within and beyond the academy. Write a letter of thanks to the provider of the scholarship, and submit copies of the letter to the Director of Jewish and Israel Studies Program within the same thirty day period. Inform in writing the Director of the Jewish and Israel Studies Program within thirty days as to whether the student will accept the scholarship. Students are responsible for retrieving letters of recommendation from their professors (preferably JISP faculty). Those letters should be conveyed to Dr. Richard M. Golden in sealed envelopes, with the professor's signature on the seal. no later than April 5, 2019, for scholarships to be awarded for the 2019-2020 academic year. To be eligible, an applicant must meet the requirements for all scholarships, outlined here. Each student awarded the Howard H. Schultz Scholarship will write letters of thanks to both Howard H. Schultz, whom the scholarship honors, and to Jaynie Schultz and Ron Romaner, who established the scholarship. Direct all inquiries about these Scholarships to Professor Richard Golden, Director of the Jewish and Israel Studies Program.